June 9, 2017 was a special day with the Programme for Belize Archaeological Project (PfBAP). It was the day we went to Lamanai. 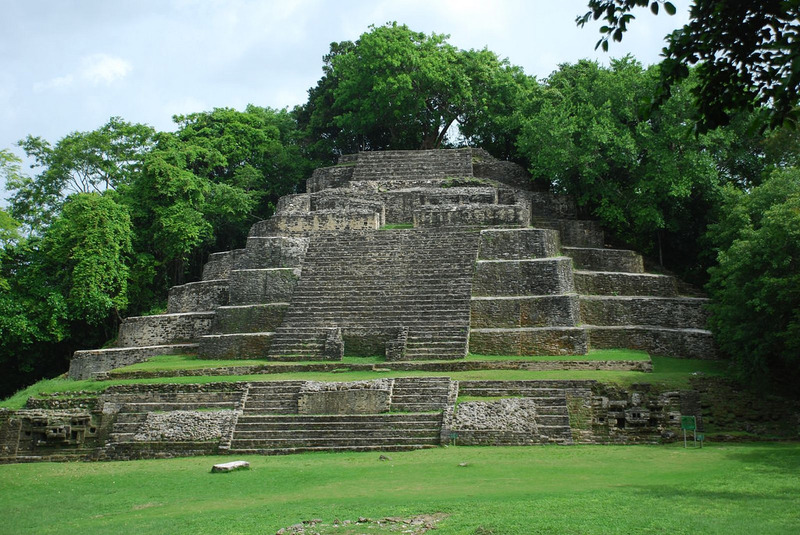 Lamanai is a well-known Mayan city and archeological site. Located in the Orange Walk district of Belize, the Classic Maya continued to use Lamanai after many other urban centers in the region had been abandoned. As the Lamanai Archaeology Project states, Lamanai was an active agricultural settlement by 1500 B.C. The construction of residential and religious buildings began around 500-700 B.C. (Lamanai Archaeology Project). While many of Lamanai’s structures gradually fell into ruin, there is evidence of ritual activity until at least 1400-1450 A.D. The Maya continued to utilize the area adjacent to Lamanai until Spanish colonizers arrived in 1543-44 A.D. The Spanish tore down the inhabiting Maya’s major spiritual center, and replaced it with a Christian church (Lamanai Archaeology Project). To get to Lamanai, we piled into what appeared to be a modified school bus early in the morning. The bus was driven by Abner Chell of Chell’s Bus Service, who would later become a great friend. 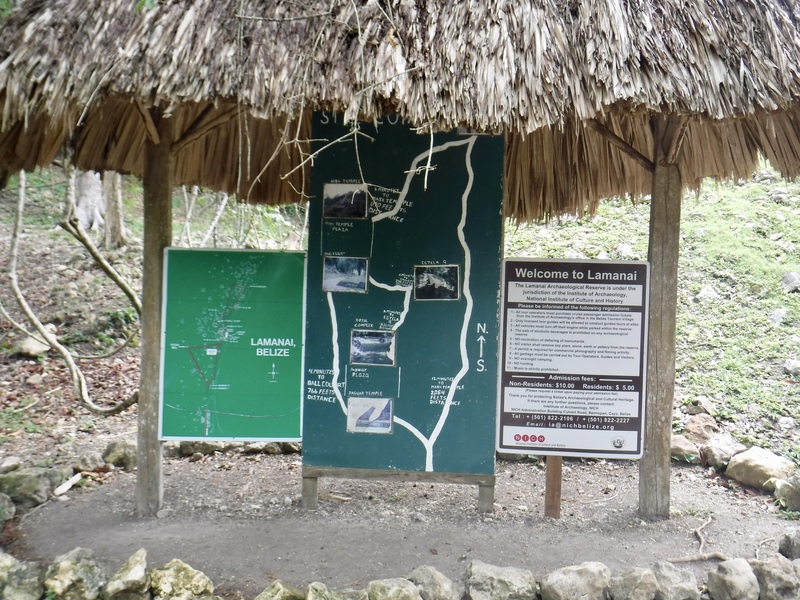 A map of the trails at Lamanai. The bus ride to Lamanai was a joy. Before I started graduate school and lost all free time, I had been trying to teach myself Spanish. In order to get used to hearing the language, I had begun listening to reggaeton music. Abner played hits by many of my favorite artists, such as J Balvin and Nicky Jam. Hearing those songs again transported me to an easier, happier time. The music stopped once we reached Lamanai, but our visit had just begun. The trails in the archaeology park were organized in an oblong loop. I chose to tour Lamanai with Walter, whom I introduced here, and his girlfriend Marisa. Walter, Marisa, and I followed a gravel path to the Mask Temple. The trail itself was a work of art: the gravel had been raked smooth and it was shaded by expertly-landscaped trees. But the real treasure was the temple. The Mask Temple was a pyramid-shaped structure made of stone, and its central staircase was flanked by exquisitely-carved Mayan masks. The level of craftsmanship was astounding. The Mask Temple at Lamanai that I visited with Walter and Marisa. A close-up of the Mayan masks that give the Mask Temple its name. From there, we walked to the High Temple. At 33 metres (108 ft), this is the tallest temple at Lamanai (Heyworth, 2014). Walter, Marisa, and I crossed paths with the rest of the PfBAP group at the High Temple. Everyone was climbing the temple to take pictures from its summit, so naturally we did the same. Once I had reached the top of this phenomenal structure, I gazed out at the rest of Lamanai. The plaza below us was blanketed with trees, which would have been largely cleared during Lamanai’s heyday. The High Temple at Lamanai, with a military helicopter in the background. The view from atop the High Temple, with some of the PfBAP students on the platform below. It is basically a law that if you go to Lamanai, you have to take a picture of yourself on top of the High Temple. In the background is the lagoon that may have contributed to Lamanai’s longevity. While taking in the view, I remarked that Lamanai probably looked better now that the trees had regrown. An archaeology student standing beside me disagreed. He emphasized how incredible Lamanai would have looked during the height of its prominence, when the temples were well-maintained and the city bustled with human life. This brief conversation highlighted the importance of perspective. Being primarily interested in the natural world, I was inclined to find the trees more captivating than the Mayan structures. My friend, being an archaeologist, was more focused on the (admittedly impressive) built environment. We see what we have learned to see. After taking our obligatory High Temple photographs, Walter, Marisa, and I continued our tour. We passed an ancient Mayan ball court, saw a replica of a beautifully-carved stela, and eventually made our way to the Jaguar Temple. A Mayan ball court at Lamanai. A replica of an expertly-carved stela that was found at Lamanai. The Jaguar Temple continued to be maintained long after many of the other temples at Lamanai had declined (Lamanai Archaeology Project). It was styled similarly to the Mask Temple, with stylized jaguar faces taking the place of the Mayan masks on the earlier building. My friends and I climbed to the top of the Jaguar Temple via a back staircase, where we took more pictures. I felt like such a tourist. The Jaguar Temple at Lamanai. A stylized jaguar face on the ancient Mayan Jaguar Temple in Lamanai, Belize. Standing on top of the Jaguar Temple, with the structure known as the Royal Complex behind me. We had finished our Lamanai visit and returned to Texas Camp by noon. At lunch, Sheila delivered exciting news. The jaguar researchers whom I had been trying to connect with were at the nearby La Milpa ecolodge, and if we hurried we might catch them. Unfortunately, it was a false alarm. Sheila had seen a van parked at the ecolodge that looked exactly like the researchers’ vehicle, but it turned out to belong to someone else. It would have been funny, had I not wanted to meet those researchers so badly. Still, June 9, 2017 was a great day. I would love to return to Lamanai in the near future, armed with a better camera and more knowledge about the Classic Maya. *If you ever visit Lamanai, which I highly recommend you do, you should stay at Casa Ricky’s hostel in Orange Walk town. I stayed there for two days, and it was fantastic. The rooms were comfortable, and Ricky is the best host you will find. He went above and beyond to make sure my friend and I were happy. I liked your story, great place I hope to visit at some point. Thanks Kelly! You really should check it out, and I’m serious about Casa Ricky’s. It really is the best lodging option I know of in Orange Walk, and when I stayed there it was only $17 US a night. Ricky will even give you a private tour of Lamanai, but I expect there’s an extra fee associated with that. As for Orange Walk itself, it’s probably the most charming town I passed through in Belize. It has a laid-back, semi-rural feel to it, and the people are very friendly. Since it’s in the Northwest corner of Belize (close to Guatemala), it has a more Latin American feel than much of the country. Definitely worth spending a weekend in. It is indeed an amazing place! Amazing artistry and symmetry! Wonder how they did it with the traditional tools. It truly is amazing. I’d love to learn more about how the Maya built structures like the ones at Lamanai, although that might have to wait until after grad school! Fantastic pictures! I’ve heard of Belize before, but I never heard of these Mayan structures. It’s so fascinating. I love exploring places like these. Thanks for sharing this series! Thanks for the compliment! I should clarify that Tikal is actually in Guatemala, and not Belize. But it’s pretty close to the Belizean border.